Did you know that the 13th September is Roald Dahl Day? This Summer we started reading our first chapter book and I chose George’s Marvellous Medicine to read with our 5 year old. He soon got used to fewer pictures and the chapter structure. It’s been a great way to get him to re-tell the story to me each night before we read a chapter and see just how much he’s taking in. It’s lovely to re-read stories I enjoyed when I was younger and I can’t think of a more inspiring author to introduce to my children. 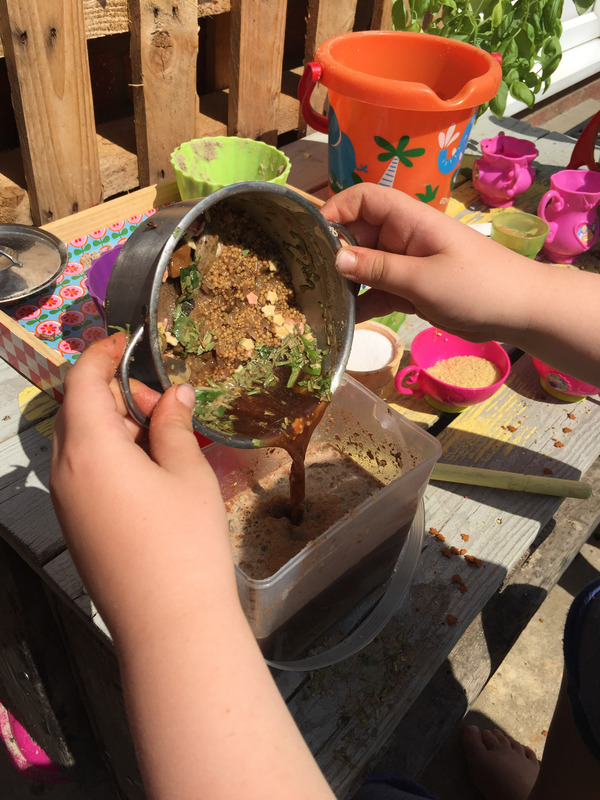 Roald Dahl stories really inspire me to craft with the children and we’ve had so much making George’s Marvellous Medicine in our very own mud kitchen. George’s nasty old grandma needs teaching a lesson. George decides the best remedy for her grumpiness is a special home-made medicine. But Grandma gets more than she bargained for! 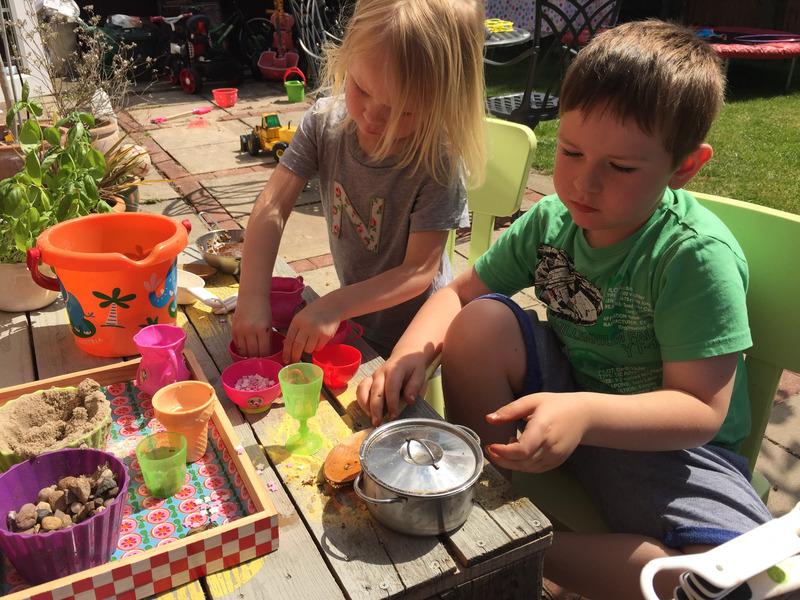 As we’ve been spending lots of time outdoors we thought we would make our own version of George’s Marvellous Medicine. 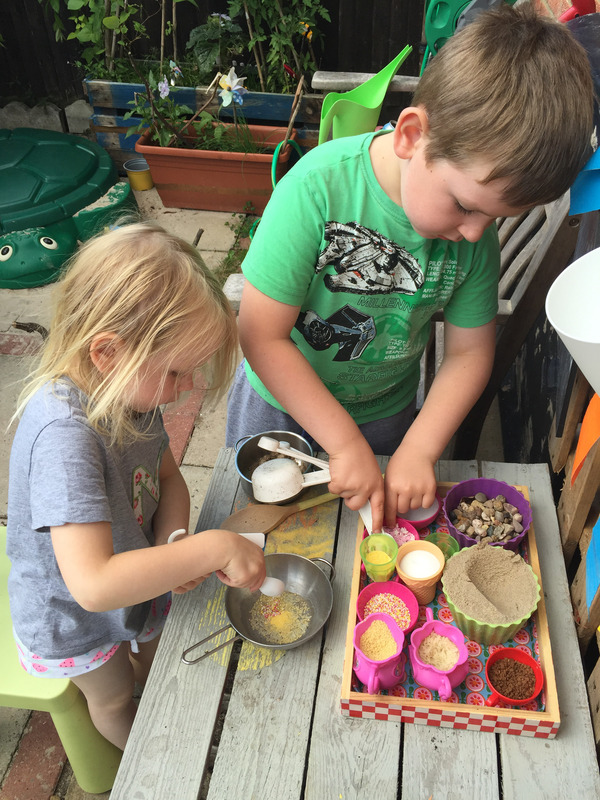 Our mud kitchen gets lots of use so it seemed like the perfect opportunity to make something other than mud cakes. 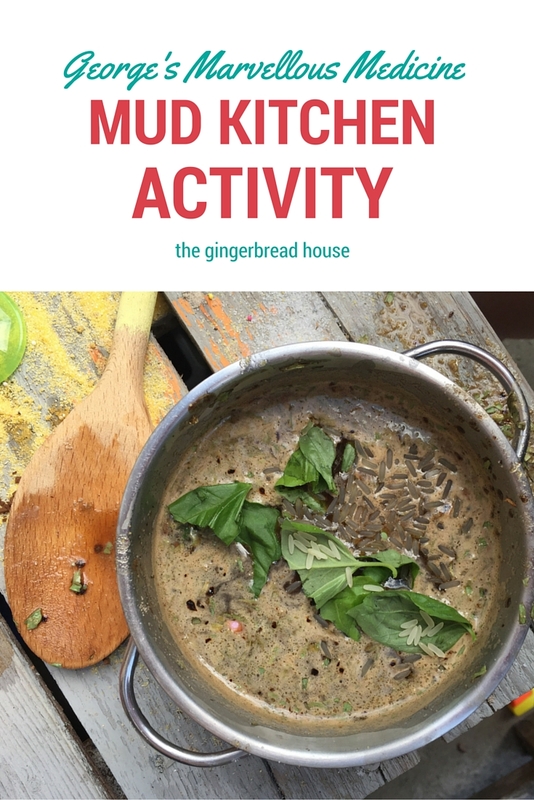 This mud kitchen activity is a great excuse for an outdoor scavenger hunt. I asked the children to find as many different items in the garden and they filled pots with stones, soil, grass, flower petals, herbs and leaves. To this I added items from the cupboard which had gone past their sell by date, including dried pasta, rice, coffee, sugar and salt. They used rain water to mix everything into a soup. 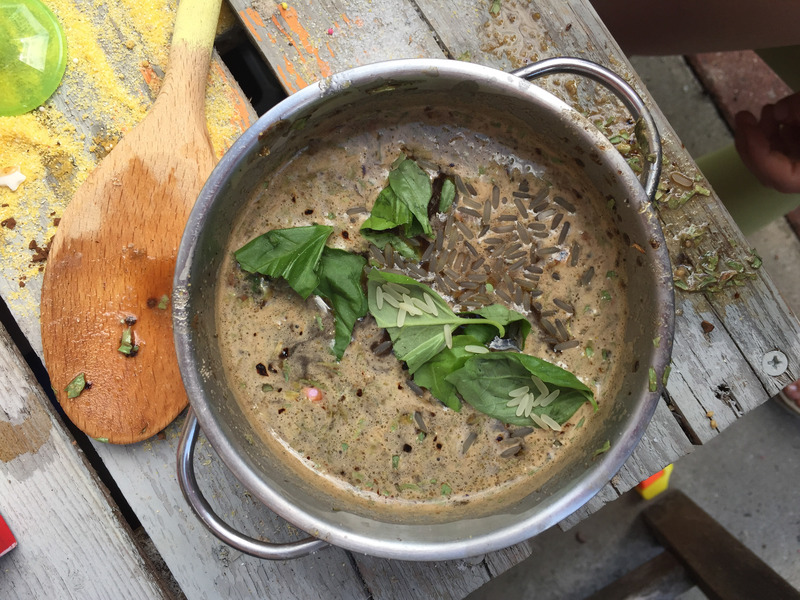 The children took pots and pans from their mud kitchen and started mixing their own Marvellous Medicine. They enjoyed measuring out different amounts and mixing up their concoctions. Sometimes it looked and smelled really good, other time it looked pretty disgusting. When they had finished they placed it on the shelf of their kitchen to ‘cook’ it, just like George does. This has been one of our favourite crafts this summer. It’s really lovely to craft alongside reading a book, it gave us the chance to talk about the story and characters more. The children kept making more and more medicine until they had exhausted all their supplies. They had fun and they’ve asked to do this again which means this craft activity was a success! Love it! 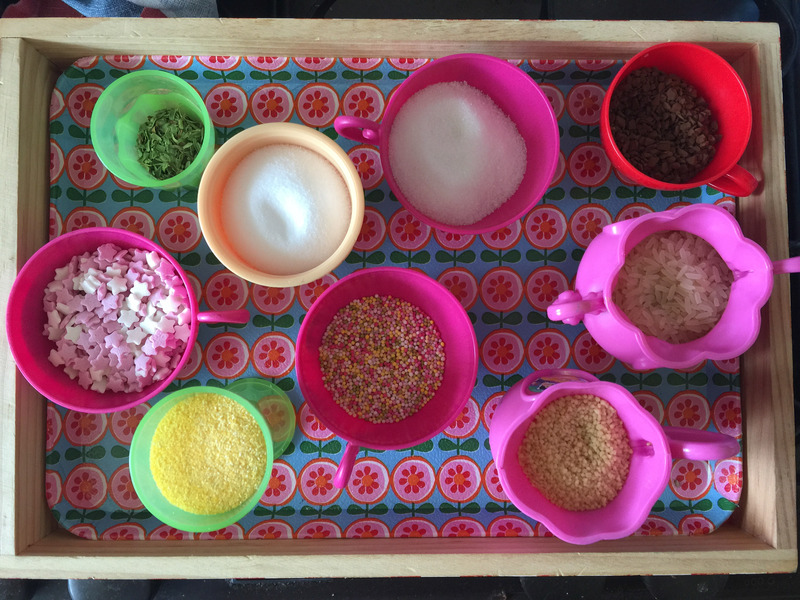 What a lovely way to make mud pies and concoctions, with a story too. Fantastic idea! This is very interesting and fun! My kids would love this activity!